Is it possible to talk about monastic women writers without discussing community? Even the collaborative efforts by which so many monastic women’s texts were created and handed down bring the community context and influence to the foreground. And they give us our general idea of “monastic community”: nuns in their black or gray habits, singing the Divine Office together every day, recording the revelations reported by a particularly special community member. But this is a purposefully distorted picture. The community of people within a monastery included a variety of servants and lay sisters (or brothers). Lay sisters, sometimes known as conversae, professed similar vows to choir nuns, but their mode of religious life was strictly providing manual labor for the convent. Joining the convent from the rural peasantry or urban lower classes, they did not sing the liturgy, meditate over books and images, or even learn to read at all. Pirckheimer tells us the what that happened to the servants, but both the “we” and the emotional reaction (it is clear in context) only apply to the choir sisters. However, these women joined convents rather than seeking secular employment for a reason. They had spiritual goals and spiritual lives of their own, but they seem almost completely silenced. To make matters worse: an even rarer case where a lay sister is allowed an actual voice, in the spiritual autobiography of 14th-century Dominican nun Margaretha (Margaret) Ebner, the picture is hardly flattering. In 1324, Ebner and the other nuns of Maria Medingen had to flee their convent for safety during a flare-up of fighting between yet another Holy Roman Emperor and yet another pope. Ebner reports that the convent prayed feverishly for protection. She even had a vision of the convent filled with “poor people” [souls in purgatory] who instructed her to pray vigils to God on their behalf for the health of the community. 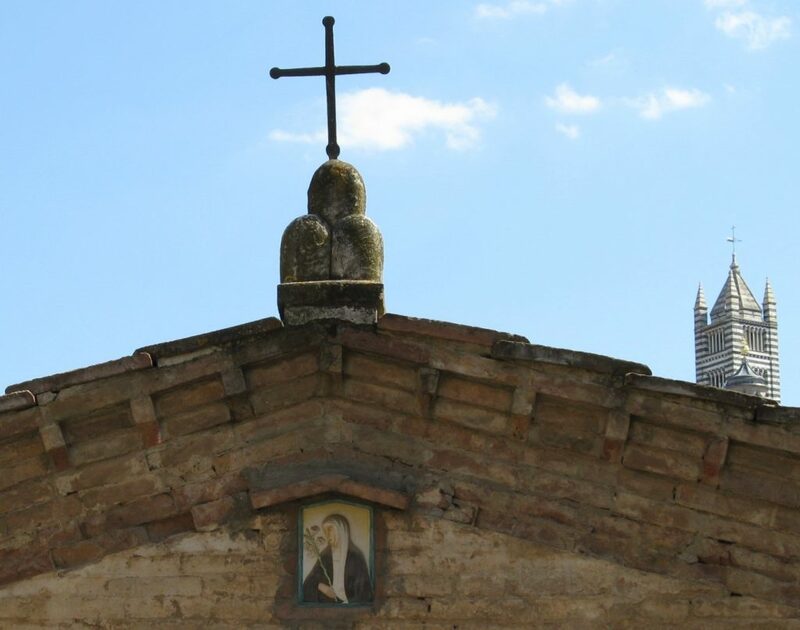 Ebner presents a picture of a lay sister who cannot comprehend the importance or the point of an actual monastic life—who does not, it seems, even understand prayer. And it hinders her to the extent of trying to deny Ebner the chance to pray with the goal of the safety of her community—the community they both supposedly belong to. Was this lay sister just another person who thought Ebner should be relieved to have a “vacation” from monastic drudgery? That does not seem to describe someone who would vow their entire life to serving nuns who sang the liturgy daily. It’s important to note that Ebner started her spiritual biography in 1344, twenty years after this supposed incident, and that she was working within very specific genre conventions. Namely, both the text and the life it claimed to described needed to fit specific patterns of holiness. Even if the Offenbarungen relate some version of an actual incident, it serves a very particular purpose in the text. Ebner’s commitment to the liturgy, to claustration even in the secular world, to the safety of her convent community is on full display. It even receives divine confirmation! Instead of a voice of protest, thus, the lay sister is rendered a prop for Ebner’s sanctity. Whether or not she ever thought or told Ebner that maybe she should back off the prayers, the conventions of spiritual autobiography turn her into a literary device. But conventions only work if they make sense to readers. In this case, that means understanding and accepting that Ebner would flee her convent for her mother’s home, and that a lay sister would accompany her. That was not the typical pattern, in which the community would evacuate together (including servants, books, and chickens, it is often noted). The lay sister is specifically identified as such, not as a servant, and at any rate, there would have been servants aplenty at Donauwörth. Instead, we have a case of a lay sister who went along with a nun despite an apparent lack of a warm relationship between the two (or, one hopes, Ebner would not have presented her so negatively). In other words: this is probably a woman who had nowhere else to go. Maybe her own home was too far away; maybe it was close enough to be under just as much threat as Maria Medingen. The lack of security surely shaped the lay sister’s religious life some way, including during times of relative safety. It definitely would have affected how she related to the convent as a whole, and to her experiences there. Further reading through the silences—and the silencing—of monastic texts by women and their male supporters will hopefully allow us to tease out something of the average, not just the exceptional, lay sister’s spiritual life as true members of a monastic community. Translated in Caritas Pirckheimer, Caritas Pirckheimer: A Journal of the Reformation Years, 1524-1528, ed. Paul A. MacKenzie (Boydell and Brewer, 2006), 74. Philipp Strauch, ed., Margaretha Ebner und Heinrich von Nördlingen: Ein Beitrag zur Geschichte der deutschen Mystik (Tübingen: Mohr Siebeck, 1882), 7. A partial English translation is available in Margaret Ebner, Margaret Ebner: Major Works, ed. and trans. Leonard P. Hindsley (New York: Paulist Press, 1993), 88. As McDermott explains, when a person comes to the sea (God) and looks into it, the first step is to observe “how supremely he himself is loved by God.” The fact that the person is loved by God is so arresting that they continue to stare into the water (125). Next, the person “beholds himself in the wellspring of the sea of the divine Essence,” and because the sea is so beautiful, the person is moved to love themselves in the sea (God) and God in themselves. The person understands that they are made in God’s image and therefore reflect goodness. This goodness cannot exist apart from the water (God) (125-126). The third step is “to love the water.” By doing this, the person is slowly transformed; “Because love always tends toward union with the beloved, the human person’s desire for union with God now emerges” (126). As the person becomes immersed in the sea, they realize that God also desires union with them. The last stage, according to McDermott’s recapitulation, is that as the person persists in gazing into the water, they come to notice their dissimilarity to God. Selfishness has left their face blemished (127). Thus, the soul begins to hate the selfish part of itself and to love more the part that resembles God (127-128). Water is a substance replete with possible symbolic meanings and is employed in many literal and figurative roles in the Bible. So it is apropos that Catherine chooses to think in these terms. As a child running about the streets of Siena, she no doubt stared into many a well and fountain, as the city contains a plethora. Well near Catherine’s house. (Yes, that’s the present author in the picture.) Photographed by Heather Hall Stewart and reproduced with permission. 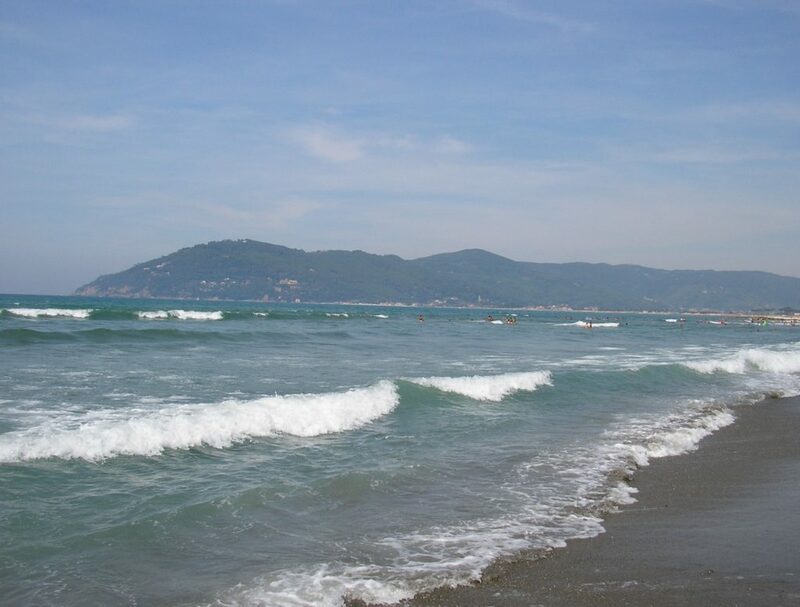 However, she consistently refers to God as the “mare pacifico.”[iii] And it was on a trip to Pisa in 1375 that Catherine first saw the Mediterranean, a year before the above letter was written. Indeed, it seems Catherine found great inspiration in the ocean during her travels. As Mary Ann Fatula notes, “The Trinity became for Catherine a ‘deep sea’ that she sought to enter with all the power of her being: ‘The more I enter you, the more I discover, and the more I discover, the more I seek you’” (66). [iv] In this beautiful chiasmus, quoted from the Dialogue’s conclusion (364), we hear resonances of St. Anselm’s (1033-1109) Proslogion. [v] And yet, in her letter, Catherine does not seem to articulate Bernard’s fourth degree of love in her progression. However, we must ask whether or not the person staring into God, the “peaceful sea,” once they have united themselves to God in abandoning self-interest, would be like the man depicted in what follows, having become immersed in the water. Tuscan Seaside. Photographed by Heather Hall Stewart and reproduced with permission. In the chapter titled “Catherine’s Wisdom” in Raymond of Capua’s vita of St. Catherine of Siena—what is known as the Legenda maior—he relates a particular discussion between himself and the saint in which she outlines her beliefs concerning love. [vi] Though brief, Raymond tells us that through self-knowledge, “The soul that sees its own nothingness and knows that its whole good is to be found in the Creator forsakes itself and all its powers and all other creatures and immerses itself wholly in Him.”[vii] Indeed, the soul directs “its operations towards Him […] never alienating itself from Him, for it realizes that in Him it can find all goodness and perfect happiness” (86). This same idea, which aptly expresses the progression through Bernard’s first three degrees of love, is stated in Catherine’s Dialogue and Letters numerous times, but Raymond continues to relate her argument to describe a fourth degree. Catherine teaches that once the soul has come to an awareness of God’s beneficence and love, “Through this vision […], increasing from day to day, the soul is so transformed into God that it cannot think or understand or love or remember anything but God and the things of God. Itself and other creatures it sees [and remembers] only in God” (86). To this synopsis, Raymond appends an analogy, illustrating for us Catherine’s thought. He tells us that when a soul has united with God, “it is like a man who dives into the sea and swims under the water: all he can see and touch is water and the things in the water, while, as for anything outside the water, he can neither see it nor touch it nor feel it.” Furthermore, “If the things outside the water are reflected in it, then he can see them, but only in the water and as they look in the water, and not in any other way.” Raymond finishes his summary of Catherine’s theology of love, as it were, by saying that “This […] is the true and proper way of delighting in oneself and all other creatures, and it can never lead to error, because, being necessarily always governed by God’s ordinance, it cannot lead to […] anything outside God, because all activity takes place within God” (86). The picture that Raymond paints is remarkably similar to St. Bernard’s fourth degree of love but far more vivid and comprehensible to someone existing in an embodied, terrestrial state. Moreover, it is quite clear that both Catherine and Raymond believe that the fourth degree of love can be reached on this earth, in this life, while Bernard shies away from this possibility. While Raymond certainly gleans his aquatic imagery from Catherine’s letter, his understanding of the fourth degree of love—in keeping with Bernard’s terminology—stems, in large part, from her Dialogue. [viii] Looking back, with Raymond’s analogy under our belts, the person standing on the beach in Catherine’s letter possesses the possibility of jumping into the sea and looking back to shore with a new perspective, viewing the world, then, from the opposite vantage point. In all actuality, what Raymond is doing is combining Catherine’s teachings into this powerful illustration, integrating what she writes in her letter with the thought she lays out in her Dialogue. He, in essence, glosses her theology of love. While all hagiographers have their own agenda and will oftentimes bend the life of a holy person to fit certain clerically approved tropes, Raymond is faithful, I think, in this case to the message that Catherine so desperately sought to express. But more than this, he also shows us that Catherine lived according to her theology, even attaining the ultimate degree of love. For Catherine, the pivotal movement occurs when the growth of fidelity continues, as Noffke puts it, “deepening into friendship and even spousal relationship with God” (67). This, for Catherine, takes place in Christ’s heart—not the mouth, as in much of the commentary tradition on the Song of Songs. While Raymond may often call Catherine the “bride of Christ,” this is not the end of love’s stages as taught or lived by St. Catherine, nor is it for Raymond. For Catherine, the mouth is used for other purposes—meditation and ministry. When the soul has reached the mouth of Christ and excellence, Catherine informs us in her Dialogue that, “she shows this by fulfilling the mouth’s functions;” that is, “she speaks […] with the tongue of holy and constant prayer.” This tongue possesses a dual expression: interiorly it prays for souls; exteriorly, the mouth “proclaims the teaching of […] Truth, admonishing, advising, testifying, without any fear” (140). This is how the human person attains Bernard’s fourth degree; they turn from their all-absorbing bond with God back to the world, extending, in their action, the love of God—God himself—in which they now perfectly participate. In its neighbors, the soul is “afforded the means to practise love of God,” which then results in a more unitive relationship with God (Cavallini 142). [ix] Raymond portrays Catherine making this transition at the beginning of the second part of her vita when she is called to a more active life. 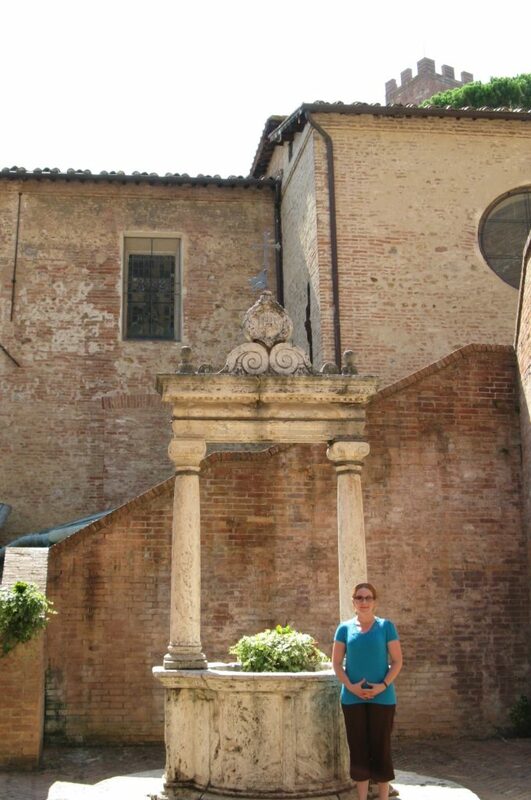 Statue commemorating Catherine inside her childhood home in Siena. Photographed by Hannah Zdansky. Ashley, Benedict. “St. Catherine of Siena’s Principles of Spiritual Direction.” Spirituality Today 33 (1981): 43-52. Astell, Ann W. Eating Beauty: The Eucharist and the Spiritual Arts of the Middle Ages. Ithaca: Cornell University Press, 2006. Astell, Ann. “Heroic Virtue in Blessed Raymond of Capua’s Life of Catherine of Siena.” Journal of Medieval and Early Modern Studies 42 (2012): 35-57. Catherine of Siena: The Creation of a Cult. Ed. Jeffrey Hamburger and Gabriella Signori. Turnhout: Brepols, 2013. Coakley, John W. Women, Men, and Spiritual Power: Female Saints and Their Male Collaborators. New York: Columbia University Press, 2006. Friedman, Joan Isobel. “Politics and the Rhetoric of Reform in the Letters of Saints Bridget of Sweden and Catherine of Siena.” Livres et lectures de femmes en Europe entre Moyen Âge et Renaissance. Ed. Anne-Marie Legaré and Bertrand Schnerb. Turnhout: Brepols, 2007. 279-294. Gardner, Edmund G. “St. Catherine of Siena.” The Hibbert Journal 5 (1906): 570-589. Hollywood, Amy. Acute Melancholia and Other Essays: Mysticism, History, and the Study of Religion. New York: Columbia University Press, 2016. Levasti, Arrigo. My Servant, Catherine. Trans. Dorothy M. White. London: Blackfriars Publications, 1954. Luongo, F. Thomas. “Cloistering Catherine: Religious Identity in Raymond of Capua’s Legenda maior of Catherine of Siena.” Studies in Medieval and Renaissance History 3 (2006): 25-69. Luongo, F. Thomas. The Saintly Politics of Catherine of Siena. Ithaca: Cornell University Press, 2006. Mews, Constant. “Catherine of Siena, Florence, and Dominican Renewal: Preaching through Letters.” Studies on Florence and the Italian Renaissance in Honour of F. W. Kent. Ed. P. F. Howard and C. Hewlett. Turnhout: Brepols, 2016. 387-403. Mews, Constant. “Thomas Aquinas and Catherine of Siena: Emotion, Devotion, and Medicant Spiritualities in the Late Fourteenth Century.” Digital Philology: A Journal of Medieval Cultures 1 (2012): 235-252. Noffke, Suzanne. “Catherine of Siena, Justly Doctor of the Church?” Theology Today 60 (2003): 49-62. Noffke, Suzanne. “Catherine of Siena.” Medieval Holy Women in the Christian Tradition c. 1100-c. 1500. Ed. A. Minnis and R. Voaden. Turnhout: Brepols, 2010. 601-622. Tylus, Jane. Reclaiming Catherine of Siena: Literacy, Literature, and the Signs of Others. Chicago: University of Chicago Press, 2009. Walsh, Ann. “St. Catherine of Siena: Doctor of the Church.” Supplement to Doctrine and Life 8 (1970): 134-144. [i] For the dating, see Noffke’s The Letters, vol. 2, p. 2. In what follows, however, I am making use of the letter as translated by Kenelm Foster and Mary John Ronayne in I, Catherine: Selected Writings of St. Catherine of Siena. London: Collins, 1980. Suzanne Noffke renders the Italian fonte, which possesses multiple meanings, as the very literal ‘fountain.’ I think this word would best be translated as ‘wellspring,’ as in Foster and Ronayne’s edition, or even ‘fount,’ both meaning the water itself. ‘Wellspring’ also better captures the image of Christ as the source of living water (John 4:7-15; 7:37-38). [ii] Insofar as the water acts as a mirror, Catherine’s thinking here shares much with St. Augustine’s in De Trinitate (c. 400-416). [iii] At the end of the Dialogue—after having exclaimed “O abyss! O eternal Godhead! O deep sea!”—Catherine concludes her discussion of faith by saying, “Truly this light is a sea, for it nourishes the soul in you, peaceful sea, eternal Trinity. Its water is not sluggish; so the soul is not afraid because she knows the truth. It distills, revealing hidden things, so that here, where the most abundant light of faith abounds, the soul has, as it were, a guarantee of what she believes. This water is a mirror in which you, eternal Trinity, grant me knowledge; for when I look into this mirror, holding it in the hand of love, it shows me myself, as your creation, in you, and you in me through the union you have brought about of the Godhead with our humanity” (365-366). [iv] See Fatula’s Catherine of Siena’s Way. Wilmington, DE: Michael Glazier, 1987. [v] Anselm petitions God: “Teach me to seek you, and as I seek you, show yourself to me, for I cannot seek you unless you show me how, and I will never find you unless you show yourself to me. Let me seek you by desiring you, and desire you be seeking you; let me find you by loving you and love you in finding you” (243). This language is very similar to the opening of St. Augustine’s Confessions. For this translation, see The Prayers and Meditations of Saint Anselm with the Proslogion. Trans. Benedicta Ward. New York: Penguin Books, 1973. [vi] The English translation used is the following: The Life of St. Catherine of Siena. Trans. George Lamb. Rockford, IL: TAN Books and Publishers, Inc., 2003. The work on which this is based is S. Caterina da Siena. Trans. Giuseppe Tinagli. Siena: Cantagalli, 1934, with reference to the Latin Bollandist text of 1860. [vii] On the importance of self-knowledge, see Thomas McDermott’s “Catherine of Siena’s Teaching on Self-Knowledge.” New Blackfriars 88 (2007): 637-648. In short, Catherine views self-knowledge as the fundamental basis of spiritual development (643). [viii] Without a doubt, Raymond was very familiar with the material of Catherine’s Dialogue, for he quotes it to a great extent in one of the later chapters in the vita, titled “For Christ Alone.” In fact, another one of Catherine’s letters addressed to him (T272/G90) also recounts some of the same ideas as found in the Dialogue. [ix] See Giuliana Cavallini’s Catherine of Siena. London: Geoffrey Chapman, 1998. [x] See Karen Scott’s “St. Catherine of Siena, ‘Apostola.’” Church History 61 (1992): 34-46. [xi] For this letter, see pp. 538-39 of Le Lettere di Santa Caterina da Siena. Ed. Antonio Volpato, in Santa Caterina da Siena: Opera Omnia. Testi e concordanze. Ed. Fausto Sbaffoni. Pistoia: Provincia Romana dei Frati Predicatori, 2002. The translation is taken from p. 156 of Jane Tylus’s chapter “Mystical Literacy: Writing and Religious Women in Late Medieval Italy” in A Companion to Catherine of Siena. Ed. Carolyn Muessig, George Ferzoco, and Beverly Mayne Kienzle. Leiden: Brill, 2012. St. Catherine Benincasa is one of only four women to be declared a Doctor of the Church (Oct. 4, 1970) for her contribution to the understanding of Christian scripture and for her advancement of theology. That said, there has long been discussion of the extent to which Catherine was educated, even literate, given that, as a woman during the Late Middle Ages, formal paths of learning were unopen to her. Born in 1347 into a well-off working-class family of Siena, she showed even as a child an inclination towards the holy life. 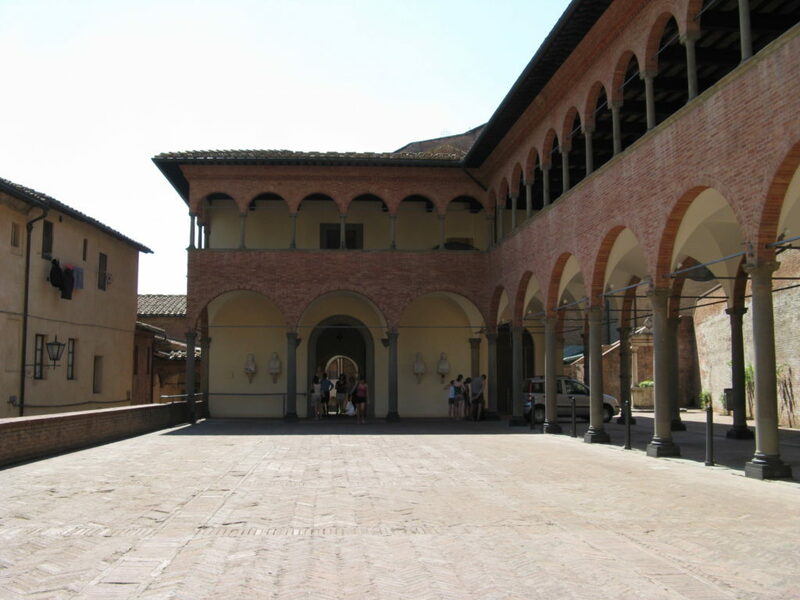 St. Catherine’s childhood home in Siena. Photographed by Hannah Zdansky. The courtyard outside the home. Photographed by Hannah Zdansky. 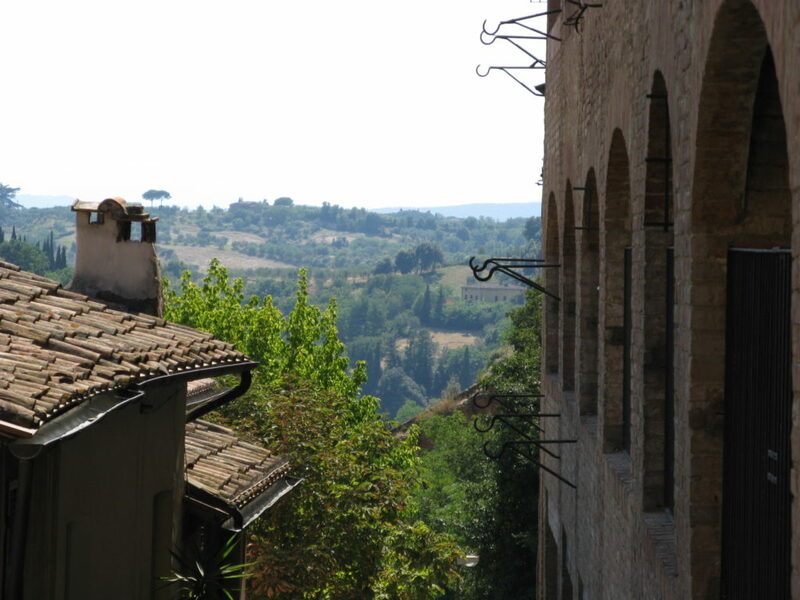 View from the home into the Tuscan countryside. Photographed by Hannah Zdansky. Against her parents’ preference to see her married, she became a Dominican tertiary at the age of eighteen. 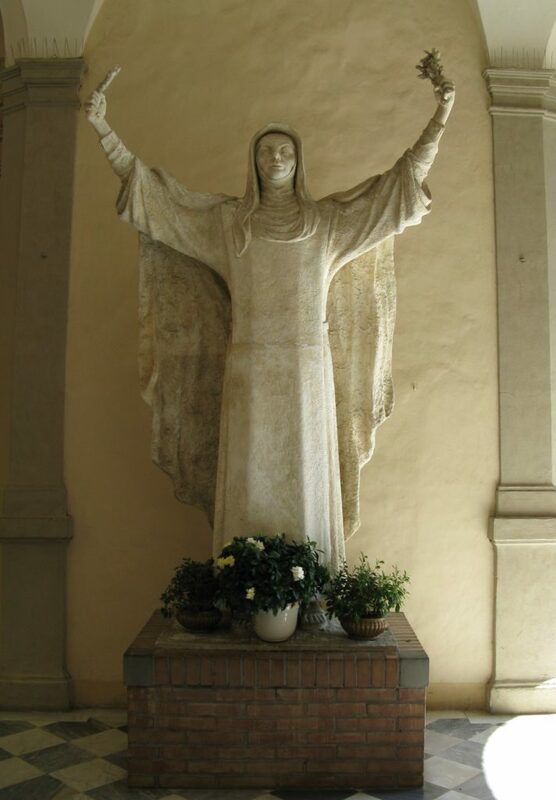 The remaining years of her life were spent in a great deal of action, tending to the poor and sick of her community as well as travelling to intercede in political disputes, but also lengthy contemplation, with her receiving many visions over her lifetime and the stigmata in 1375. Between this year and her death in 1380, Catherine also undertook to write a plethora of letters to important figures as well as to those closest to her, these being, in a way, her outlet for preaching, since, at least officially, women were not allowed to preach (as they still are not in some Christian denominations). These letters, and also her greatest work, her “libro,” the Dialogo della divina provvidenza, were almost all dictated to scribes, which has led some scholars to question the degree of Catherine’s agency in her output. But the important thing to remember is that this was not an uncommon practice even for men, and we do know that Catherine wrote some letters herself because she tells us this, though these were written in Italian, not the learned Latin of the clerical elite. Catherine, for her part, however, never let anything deter her. She is perhaps most famously known for marching to Avignon to tell Pope Gregory XI to return to Rome, which he did. 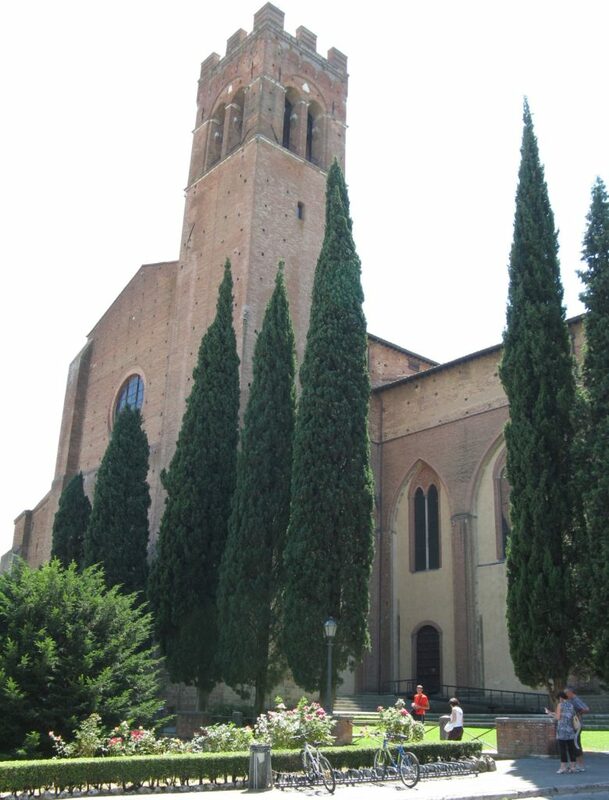 Basilica Cateriniana di San Domenico, a thirteenth-century church located just down the street from Catherine’s childhood home and in which she spent much time. Some of her relics, particularly her head, are housed here. Her body, however, lies in the Basilica di Santa Maria sopra Minerva in Rome. Photographed by Hannah Zdansky. But what of Catherine’s continued learning over the years of her ministry—on her own and through those in her circles—and her intellectual contributions? There has been consideration given to her influences in much of the scholarship, but I will focus on one predecessor that has received limited attention. We know that Catherine was inspired by the likewise politically-involved and reformative twelfth-century mystic and Doctor, St. Bernard of Clairvaux (1090-1153), because Catherine quotes Bernard in some of her letters. [i] However, it is difficult to know how exactly she might have been exposed to his works and to which ones precisely. Nonetheless, there are striking parallels between her theological thinking and Bernard’s, which is something that her confessor and later hagiographer, Blessed Raymond of Capua (1330-1399), emphasized by means of a metaphor that Catherine herself invented of God as a tranquil ocean. London, British Library, MS Additional 37049, f. 37v. 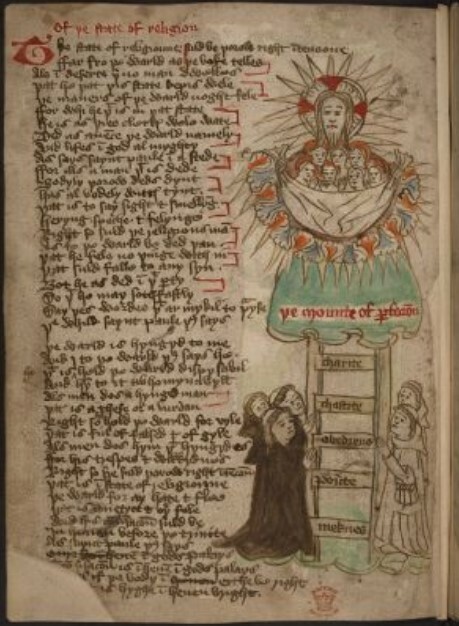 An example of a ladder from a Northern English Carthusian miscellany (c. 1460-1500), largely didactic and devotional in nature, consisting of religious treatises and poems, chronicles, and even an abbreviated version of Mandeville’s Travels. [iii] The rungs, representing certain virtues, read: “meknes” [meekness], “pou(er)te” [poverty], “obediens” [obedience], “chastite” [chastity], “charite” [charity], leading to “Þe Mounte of P(er)fecc(i)on” [The Mount of Perfection] and God’s embrace. A dramatic transformation occurs, though, between the second and third degrees. The third is attained when a person “loves God not now because of himself but because of God” (41). That is, a person turns from focusing upon themselves to focusing upon something greater, desiring God not for personal gratification, but out of pure love. At this point, caritas is achieved. The fourth degree of love, then, involves a person’s desires becoming superseded by God’s when a person comes to love themselves, others, and all of creation through God because that is God’s will, and in reaching the fourth degree, God’s and a person’s wills become one (29). However, Bernard opines that, “I doubt if he ever attains the fourth degree during this life, that is, if he ever loves only for God’s sake” (41). But if this were to be the case, Bernard says it would occur “when the good and faithful servant is introduced into his Lord’s joy, is inebriated by the richness of God’s dwelling. In some wondrous way he forgets himself and ceasing to belong to himself, he passes entirely into God and adhering to him, he becomes one with him in spirit” (41). When a soul thus arrives at the fourth degree, its final destination, it must turn back to the world through God just as a pilgrim must return to his or her point of origin, but in both cases, the person has been utterly changed through their experiences, acquiring a radically different outlook. However, the attitude that St. Bernard expresses here is that the fourth degree is tricky. Indeed, it requires much of the human person, forgoing one’s will completely and adhering entirely to God. St. Catherine conceives of a similar progression in her Dialogue, but she makes use of a common devotional image—the body of Christ. [vi] She is also more positive in her hopes for humanity, but her indebtedness to Bernard’s thinking should become abundantly clear, since she too presents a pilgrimage of love, which, as Bernard would say, “advances by fixed degrees, led on by grace” (40). According to Catherine’s schema, the journey begins in a river below a physical bridge, which is Jesus Christ, the ontological and moral Bridge joining Heaven and earth. [vii] Here, a person is trying to forge their way across the swift water into Paradise without consideration for God. But for this reason, they will never succeed (67). Suzanne Noffke, the text’s translator, refers to this stage as “slavish” love because the person is a slave to sin out of love for themselves, and even if they begin to turn to God, the regard remains servile out of fear of punishment (67). [viii] I believe this best fits Bernard’s first degree of love. As Mary Ann Follmar explains more concisely in her commentary, God, with ineffable love, sends the soul gifts, hoping that it will better recognize the true source of its blessings. If this does not work, then God allows the winds of adversity to blow, abetting self-reflection (6-7). [ix] Should all go well, according to the Dialogue, the person will realize that everything they have is from God, and due to this, they will be moved to love with a mercenary love, that is, for the profit they can derive from God (113). The mercenary love enacted at the feet of Christ the Bridge exemplifies Bernard’s second degree (Catherine’s first). As the person’s affections continue to be ordered through self-knowledge, which inextricably entails knowledge of God, they progress to the side of Jesus through which they enter into Christ’s heart via his side wound. [x] In the arduous climb to Christ’s side, the person becomes a “good and faithful servant,” but as selfishness diminishes further, they become Christ’s friend and pass into his heart (64, 115). Follmar clarifies that, “The opening in the heart signifies intimacy of affection and confidence,” which can only exist between close friends. When someone loves like a friend, they do so without respect for themselves; the person now “loves virtue and every good solely for love of God” (45). This is why they can now experience Christ’s secret, “the manifestation of divine love,” symbolized by the blood poured forth from Christ’s heart upon the cross (46). By reaching the stage where the will of the person has dissipated and is being replaced with God’s, the heart of Christ becomes the person’s own heart. This, I think, is Bernard’s third degree but Catherine’s second. For once souls have risen up in eager longing, they run in virtue along the bridge […] and arrive at the gate with their spirits lifted up to me. When they have crossed over [the bridge] and are inebriated with the blood and aflame with the fire of love, they taste in me the eternal Godhead, and I am to them a peaceful sea with which the soul becomes so united that her spirit knows no movement but in me. Though she is mortal, she tastes the reward of the immortal (147-148, my emphasis). And if the still living pilgrim then turns back to the world through God, she or he can live out Bernard’s fourth degree. McDermott notes that, “the peaceful sea is […] an image of the soul’s destiny, that of ultimate union with God,” and he is certainly correct (199). But we need to examine this metaphor a bit more closely because it is one that Catherine, as well as Raymond of Capua, rely upon a great deal. And while Catherine’s use of Christ’s body as an allegorical roadmap, of sorts, is helpful, particularly with regard to eliciting an affective response, it also remains abstract from the standpoint of human experience. How can a person, in the flesh, truly conceive of something like the fourth degree of love, conceive of being so united to God that one’s entire existence—one’s reality—is mediated through God? In short, how can we conceive of theosis? Image of Catherine on a rooftop near her home. Photographed by Hannah Zdansky. 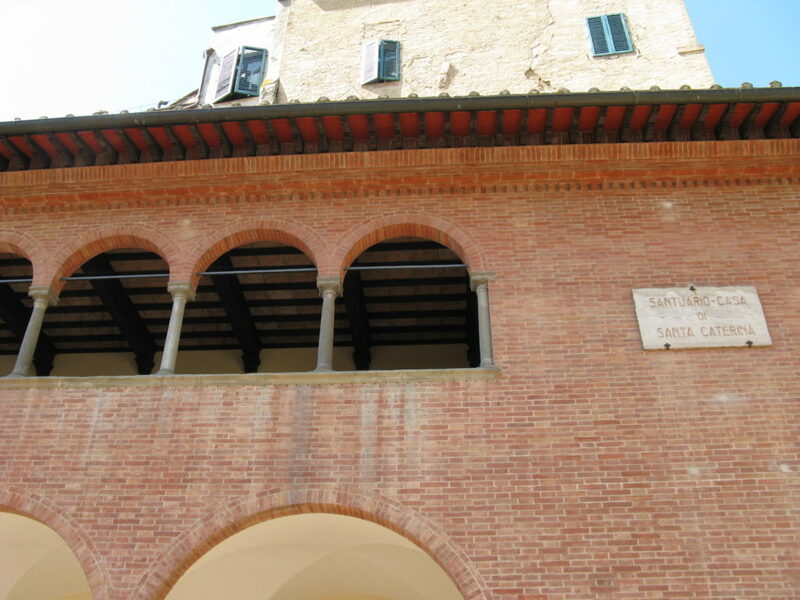 [i] One example is in a letter to the Abbess of Santa Marta in Siena. See p. 52 of vol. 1 of The Letters of Catherine of Siena. 3 vols. Trans. Suzanne Noffke. Tempe: Arizona Center for Medieval and Renaissance Studies, 2000. Kenelm Foster notes that some forty such citations have been identified in the Letters. See p. 312 of “St. Catherine’s Teaching on Christ.” Life of the Spirit 16 (1962): 310-323. [ii] It must be said, though, that Western theologians are often a bit more skeptical of the possibility of theosis than Eastern Christian thinkers, an example of which pessimism we can see in St. Bernard’s work in what follows. [iii] More information as well as the entire digitized manuscript can be found here: http://www.bl.uk/manuscripts/FullDisplay.aspx?ref=Add_MS_37049. For an excellent study, see Jessica Brantley’s Reading in the Wilderness: Private Devotion and Public Performance in Late Medieval England. Chicago: University of Chicago Press, 2007. [iv] For this translation, see On Loving God. Trans. Emero Stiegman. Kalamazoo, MI: Cistercian Publications, Inc., 1995. For an edition of the text, see Liber de diligendo Deo. Sancti Bernardi opera. vol. 3. Ed. J. Leclercq and H. M. Rochais. Rome: Editiones Cistercienses, 1963. 119-154. [v] Bernard’s understanding of charity and cupidity is very much reliant upon St. Augustine of Hippo’s (354-430). See especially Augustine’s De doctrina christiana (c. 396-427), specifically Bk. 3, Ch. 10, § 16, which is on p. 88 of the following translation: On Christian Doctrine. Trans. D. W. Robertson, Jr. Upper Saddle River, NJ: Prentice Hall, 1997. For an edition, see De doctrina christiana. Ed. J. Martin. Corpus Christianorum: Series Latina. vol. 32. Turnhout, Belgium: Brepols, 1962. 1-167. [vi] It is quite possible that Catherine was also inspired to use this image through St. Bernard’s third and fourth sermons on the Song of Songs. See On the Song of Songs I. Trans. Kilian Walsh. Spencer, MA: Cistercian Publications, 1971. [vii] The translation used throughout is the following: The Dialogue. Trans. Suzanne Noffke. Mahwah, NJ: Paulist Press, Inc., 1980. For an edition, see Il Dialogo della Divina Provvidenza ovvero Libro della Divina Dottrina. Ed. Giuliana Cavallini. Rome: Edizioni Cateriniane, 1968. [viii] See Noffke’s book Catherine of Siena: Vision through a Distant Eye. Collegeville, MN: The Liturgical Press, 1996. [ix] See Follmar’s The Steps of Love in The Dialogue of St. Catherine of Siena. Petersham, MA: St. Bede’s Publications, 1987. [x] Heather Webb mentions that St. Bernard of Clairvaux was one of the first to state definitively that the spear which pierced Christ’s side reached all the way to his heart (805). See “Catherine of Siena’s Heart.” Speculum 80 (2005): 802-817. [xi] See McDermott’s Catherine of Siena: Spiritual Development in Her Life and Teaching. Mahwah, NJ: Paulist Press, Inc., 2008. 1. Man loves himself for his own sake: “man first loves himself for himself because he is carnal and sensitive to nothing but himself” (40). 0. The River of Sin – Slavish Love: “But those who do not keep to this way travel below through the river […]. And since there is no restraining the water, no one can cross through it without drowning. Such are the pleasures and conditions of the world. Those whose love and desire are not grounded on the rock but are set without order on created persons and things apart from me […] run on just as they do” (67). “Open your mind’s eye and look at those who drown by their own choice and see how they have fallen by their sins. […] they have become servants and slaves of sin. I made them trees of love through the life of grace […]. But they have become trees of death, because they are dead. Do you know where this tree of death is rooted? In the height of pride, which is nourished by their sensual selfishness” (73). “You know that every evil is grounded in selfish love of oneself” (103). 2. Man loves God for his own benefit: “when he sees he cannot subsist by himself, he begins to seek for God by faith and to love him as necessary to himself. So in the second degree of love, man loves God for man’s sake and not for God’s sake” (40). 1. The Feet of Jesus – Mercenary Love: “There are others who become faithful servants. They serve me with love rather than that slavish fear which serves only for fear of punishment. But their love is imperfect, for they serve me for their own profit or for the delight and pleasure they find in me” (113). “They love their neighbors with the same love with which they love me—for their own profit” (114). 3. Man loves God for God’s sake: “When man tastes how sweet God is, he passes to the third degree of love in which man loves God not now because of himself but because of God” (41). 2. The Wounded Side of Jesus – Love of Friendship: “If you love me the way a servant loves a master, I as your master will give you what you have earned, but I will not show myself to you, for secrets are shared only with a friend who has become one with oneself. Still, servants can grow because of their virtue and the love they bear their master, even to becoming his very dear friend. So it is with these souls. As long as their love remains mercenary, I do not show myself to them. But they can, with contempt for their imperfection and with love of virtue, use hatred to dig out the root of their spiritual selfishness. They can sit in judgment on themselves so that motives of slavish fear and mercenary love do not cross their hearts without being corrected in the light of most holy faith. If they act in this way, it will please me much that for this they will come to the love of friendship. And then I will show myself to them, just as my Truth said: ‘Those who love me will be one with me and I with them, and I will show myself to them and we will make our dwelling place together.’ This is how it is with very dear friends. Their loving affection makes them two bodies with one soul, because love transforms one into what one loves” (115-116). 4. Man loves himself for the sake of God: “Happy the man who has attained the fourth degree of love, he no longer even loves himself except for God” (29). “man remains a long time in this [third] degree, and I doubt if he ever attains the fourth degree during this life, that is, if he ever loves only for God’s sake” (41). “No doubt, this happens when the good and faithful servant is introduced into his Lord’s joy, is inebriated by the richness of God’s dwelling. In some wondrous way he forgets himself and ceasing to belong to himself, he passes entirely into God and adhering to him, he becomes one with him in spirit” (41). 3. The Mouth of Jesus – Filial Love: “Now this is how the soul acts who has in truth reached the third stair. This is the sign that she has reached it: Her selfish will died when she tasted my loving charity, and this is why she found her spiritual peace and quiet in the mouth. […] She has let go of and drowned her own will, and when that will is dead, there is peace and quiet” (141). “She brings forth virtue for her neighbors without pain” (141). “she loves me for myself, because I am supreme Goodness and deserve to be loved, and she loves herself and her neighbors because of me, to offer glory and praise to my name” (141). “After she has come to perfect, free love, she lets go of herself and comes out […]. And this brings her to the fourth stage. That is, after the third stage, the stage of perfection in which she both tastes and gives birth to charity in the person of her neighbor, she is graced with a final stage of perfect union with me. These two stages are linked together, for one is never found without the other any more than charity for me can exist without charity for one’s neighbors or the latter without charity for me. The one cannot be separated from the other. Even so, neither of these two stages can exist without the other” (137). The views and interpretations set out in this publication are those of the author(s) and do not necessarily represent those of the Medieval Institute or the University of Notre Dame. 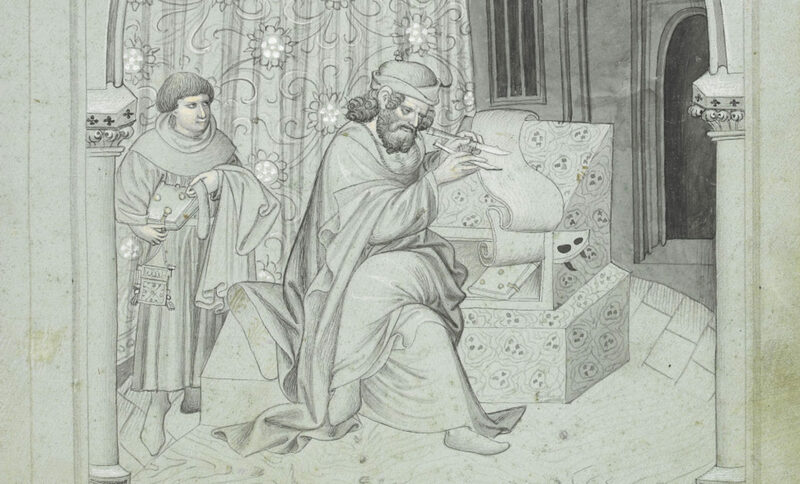 John Mandeville writing his travelogue. This image comes from a unique, Bohemian picture book version of the Voyage d’outer mer. London, British Library MS Additional 24189, fol. 4.